I made a slightly more grown up version. Well, I actually made 2. One for my dad and one for the BF’s dad. I used 2 note cards, skinny markers, one piece of card stock, and a black pen. I made it the good old fashioned way, folks! 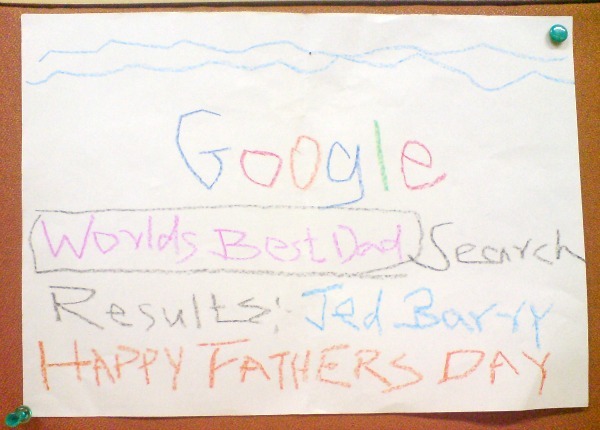 My dads name came up in the first 3 spots of the google search for world’s best dad! If google says so… it must be true! Note: The last google search is an error. I fixed it before I gave it to him! Clearly, it should say husband, instead of wife, ha! The hardest part of this card is going to be tracking down all the sponsored links siblings to sign it! 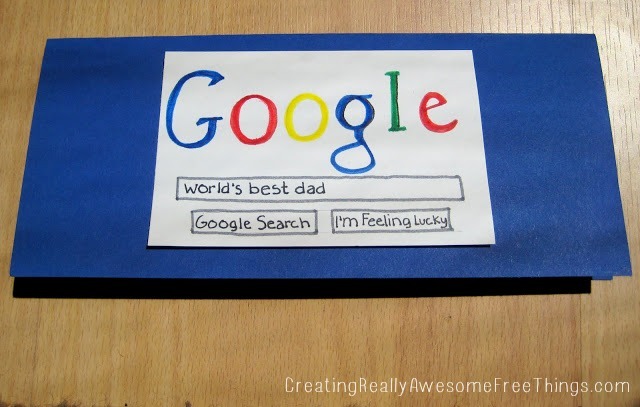 Psst… See 3 more versions of the google Father’s Day card from other crafty bloggers! And here is a free printable Google card! I'd LOVE if you could link up this project to Socialize with me Monday til Sunday! OMgosh – I love seeing really creative ideas – this is one of them!!! I am going to send this post to my daughters to make. Aw, this is a great idea! So clever and adorable. I bet both dads will love it. Thank you for participating in the Craft Therapy Session over at Life in the Pitts. Too cute. I think there might be a typo though.. or am I reading it wrong? Does it say he is "wife to a crazy lady who can't sit down"? I noticed that too! I think it was meant to say “Husband to a crazy lady who can’t sit down”. It made me laugh when I saw it, but I’m sure it was an honest mistake. I love the card though. Taking the time to create your own card will mean so much more to your dad! this is so fun and timely that I would like to invite you to link to it from our blog. today we're starting our first DIY / craft tutorial linky party, and it would be so great to have this project in it. your project is a novel idea. I'm loving it!! 🙂 That's super great. Thanks so much for sharing. Definitely something I'm going to have to do!! What a fun idea! How easy and what special meaning this would have for a dad! Thanks for linking up to Hoo's got talent! This is awesome! My husband would love this card. I will feature this at somedaycrafts.blogspot.com in the next week:) Watch for it! Your version turned out so cute too! You've got the handmade touch to it which I think is SUPER fab. I did mine high tech quite frankly only to impress my SUPER techy husband. Normally, I prefer the handmade way. what a sweet card! love the genius behind it! What a brilliant and fun idea! haha That’s so cute! I always do a homemade card for my kids to make for my husband. He always enjoys the cards each year. Thanks for sharing your craft at #SmallVictoriesSundayLinkup ! Such a cute and sweet idea! I’m pinning this card! what a cute card that a child can make for their parent. I think I am going to let my girls make this for their dad this year. Thanks for linking up at the #HomeMattersParty this week. Looking forward to seeing what you link up next week. thank u so much for the idea. one of he cutest things I have ever seen.